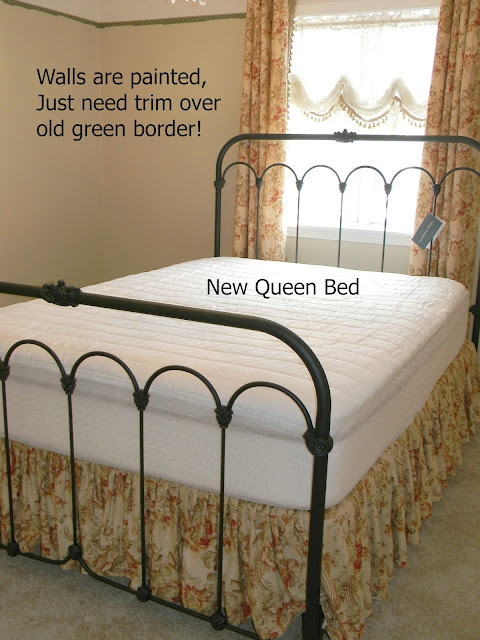 This room redo only cost me the price of the new iron bed and mattress, plus the chair rail trim, but all the rest I already had! Can't beat shopping your own home for an outcome like this, can you? I already had the paint. I purchased it at a garage sale from a friend who decided she did not like the color...and she sold two gallons to me CHEAP. I then took it to Lowes where she has bought it and found another color that I liked better and they made these two gallons the color I chose. Did you know that you could do this? Yes, if you don't like the color, just pick another closely hued color and they will retint your already tinted paint FREE! I had previously told this to the girl I bought the paint from, but she said she was not interested in doing this since she already painted her room with other paint. Now here the walls are painted but I still have that green wallpaper trim on the upper walls. 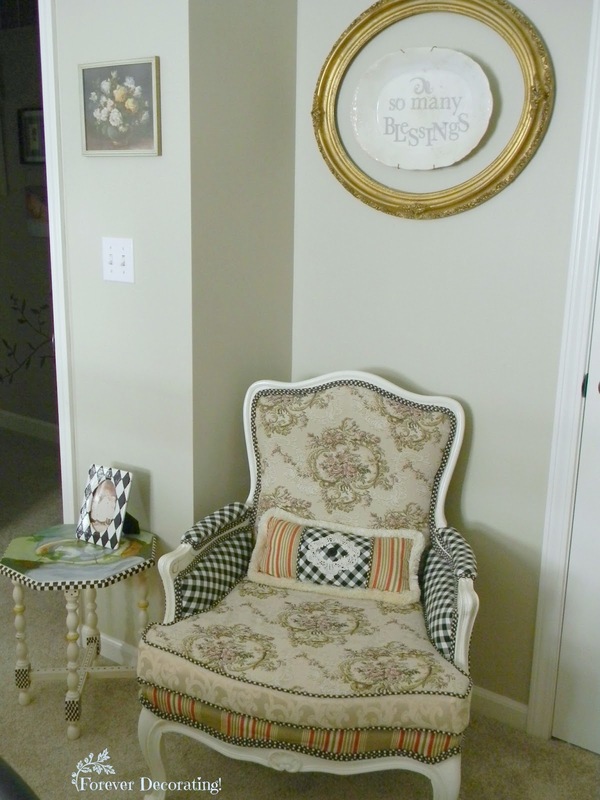 I purchased chair rail trim and painted it the trim color. I then had my young and cute, handy dandy handyman come over and install the trim. Hubby caulked and I put on another coat of paint. 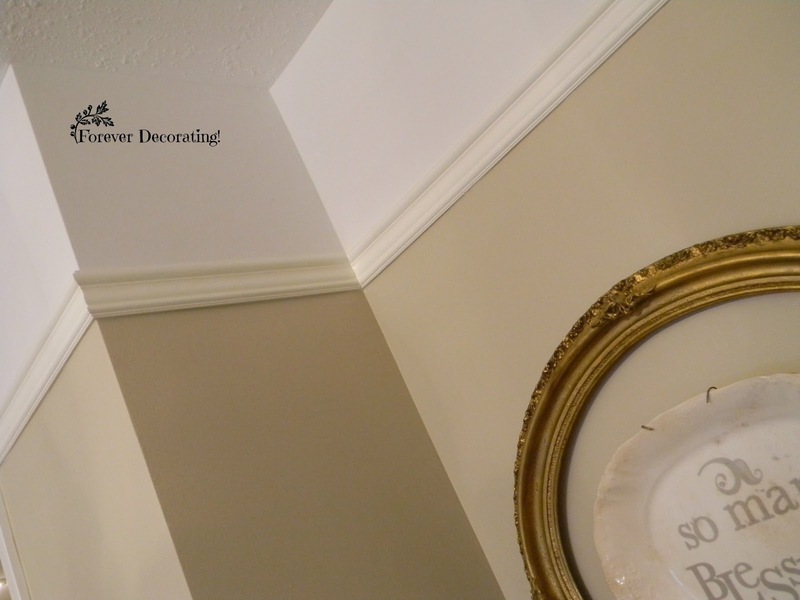 I also freshened up the upper white paint on the wall with flat white ceiling paint that I already had. The cream matelasse bed cover was stored in the closet, so I brought it out to use. 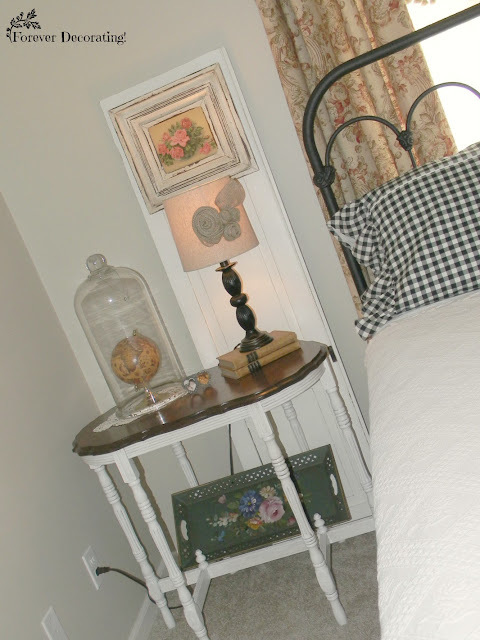 The wall decor...on each side of the bed, I used vintage cabinet doors that were out in the garage. A friend had given them to me because she didn't know what to do with them. 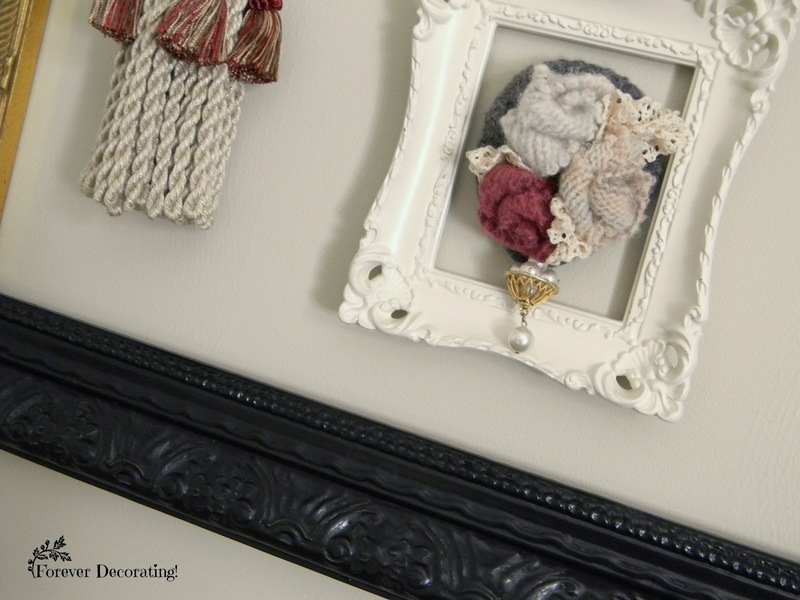 I painted them the trim color and just leaned them against the wall. 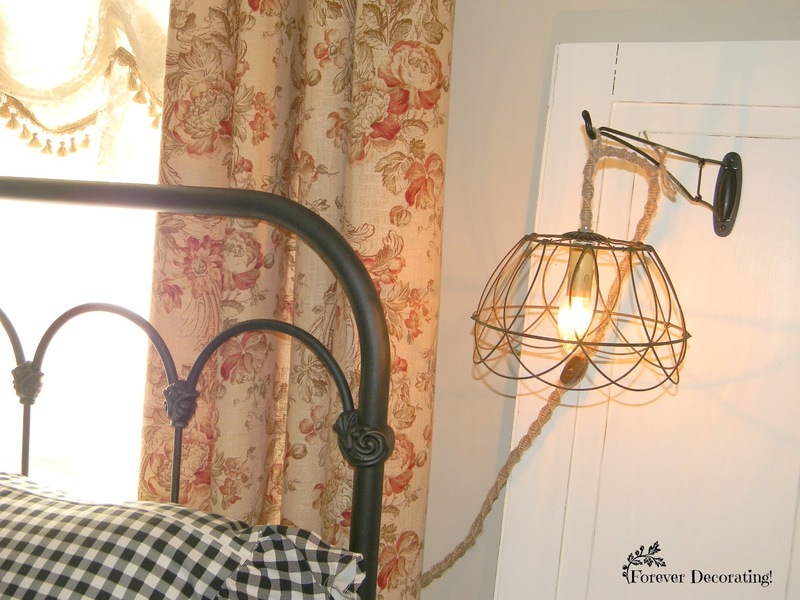 On the right side, I took a very old wire flower basket my hubby's grandma gave me and made it into a hanging light. I had picked up a couple of swing arm hooks years ago at a garage sale and used one in my kitchen. This one was just in my basement stash. I attached the hook to the freshly painted cabinet door and hung the new light from it. On the left side of the bed, I just hung an old rose picture on the cabinet door and placed the existing side table in front. I also used a black lamp that I had in storage. And painted the frame black, sans the middle artwork. 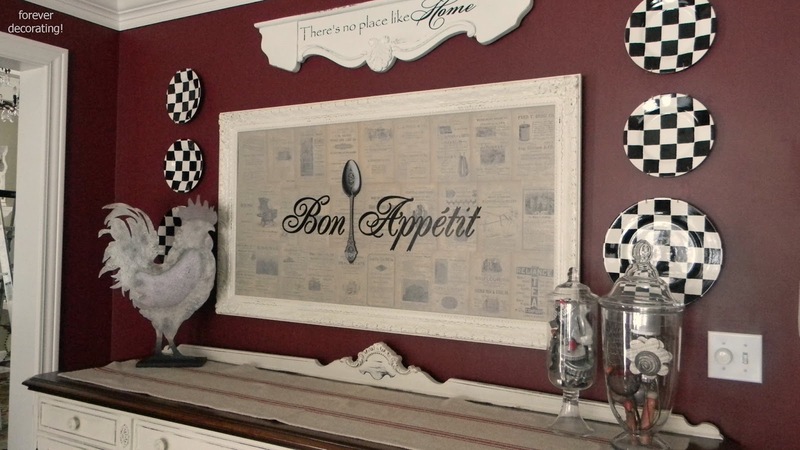 I hung it on the wall and use it to 'corral' various collage pieces from around the house. This black wooden piece was the top of a vintage easel. I cut it off and painted, "Relax & Stay A While". Now it's hung with a black and white ribbon. 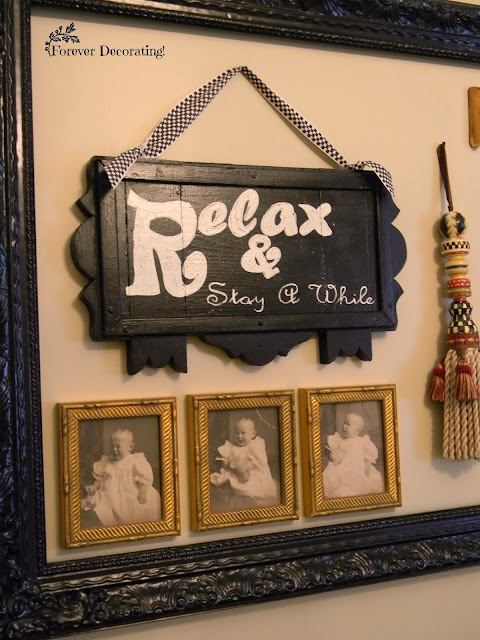 I also painted the tassel and had kept these vintage baby pictures. They are rare to find the same baby in three different poses. She is crying, laughing and just looking cute. 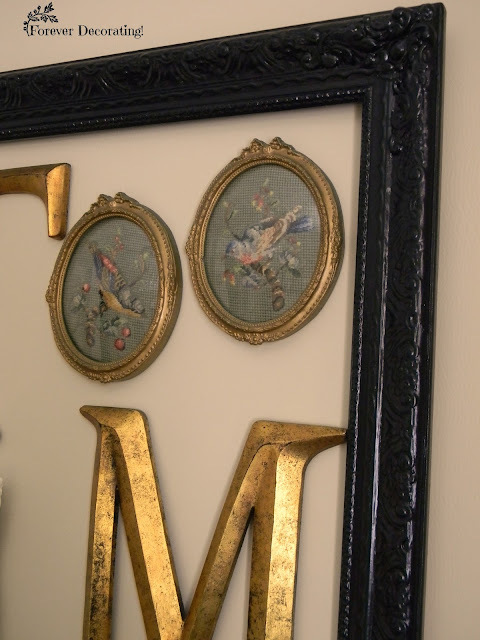 Our initials in gold taken from the master bedroom and two really old and cool bird needle points that were already in this room. 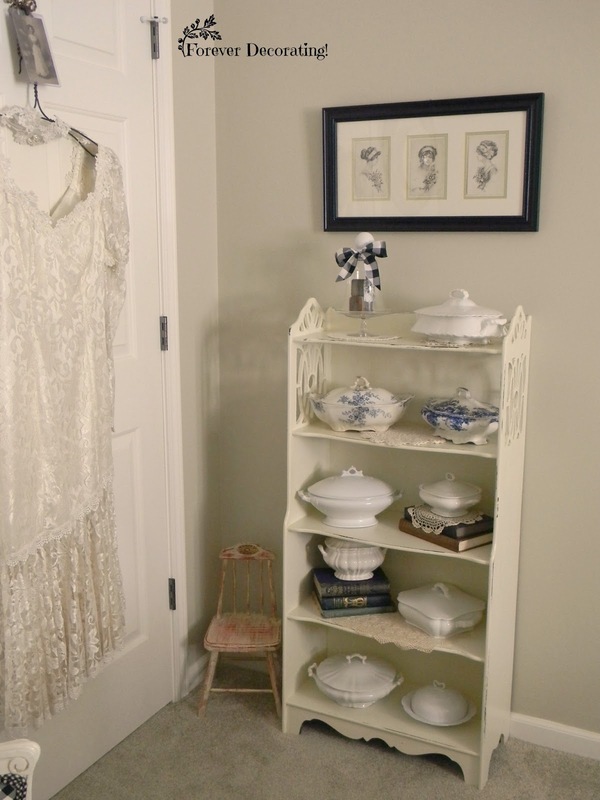 I brought back in the vintage bookcase that holds my tureen collection...and my wedding dress on the closet door. 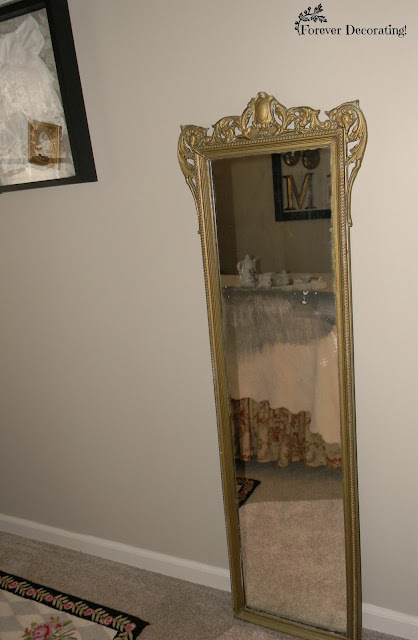 If you recall, I had vintage baby shoes in the gold frame...see them off in the corner. I did not bring back the shoes nor the vintage christening dresses. My kids didn't like sleeping in a room with them. They said they are creepy but I like them, so for now they are just stored away. 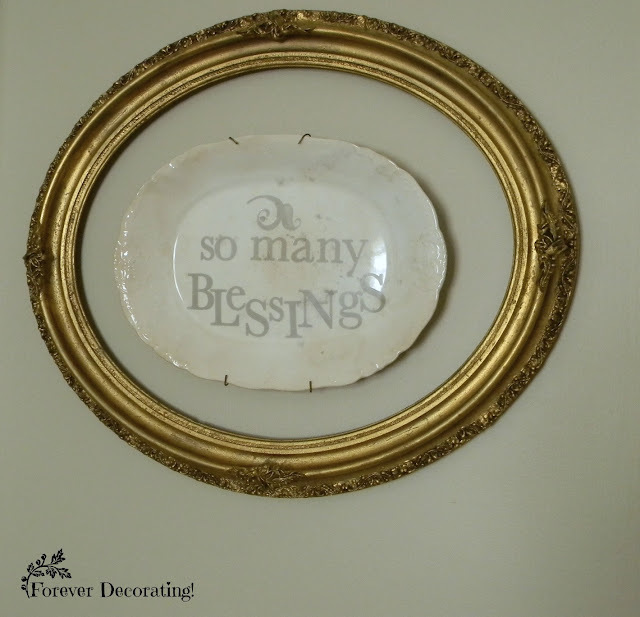 Instead, I used the gold frame on it's side and added an ironstone platter with vinyl words I had made years ago. I took that from the hallway! Lastly, I brought back the two shadow boxes of my baby sweater and hubby's baby outfit. 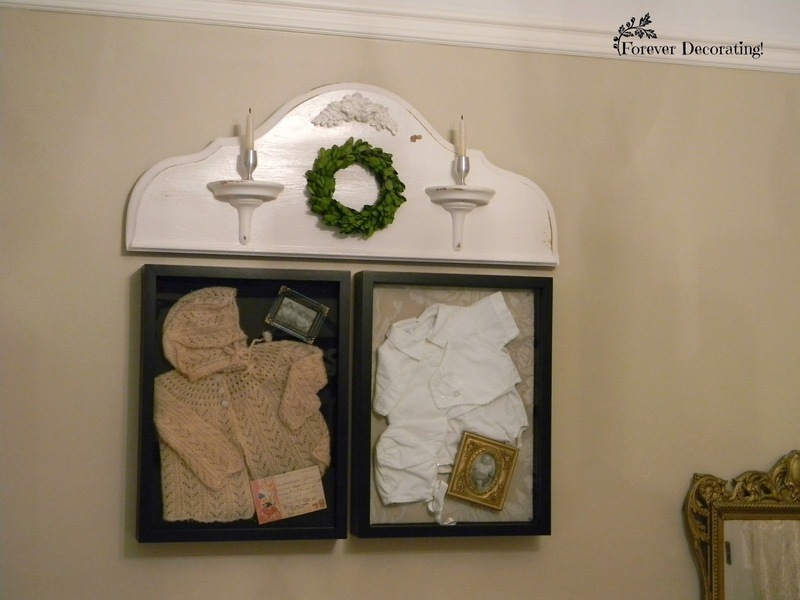 Above them, I 'stole' the wooden piece from the powder room wall, and placed it above these shadow boxes. The two little shelves has two little aluminum urns that my son made for a test in machinist school. I use them to hold taper candles. Believe it or not, I got it at a thrift store for $2 years ago and it has been sitting in my hallway until now. The silver is wearing off but that just makes it better in my book. 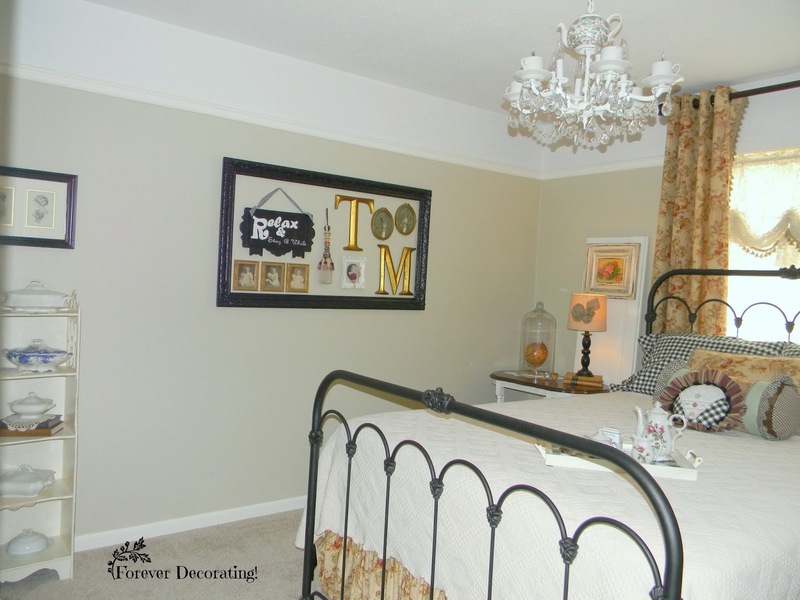 I hope you were inspired by this reveal and to show that you can shop your home and change the look of a room with a bit of creativity and very little money. 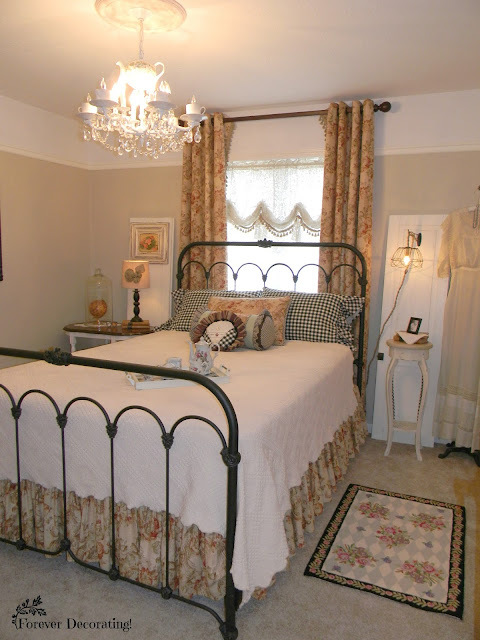 I also like the placing of the bed in front of the widow! Yup, I like the change. your guest room is beautiful. I started to list all the things I loved but it was too much..The new bed is definately worth mentioning and your sewing and so much more. Oh My Garden this is beautiful! 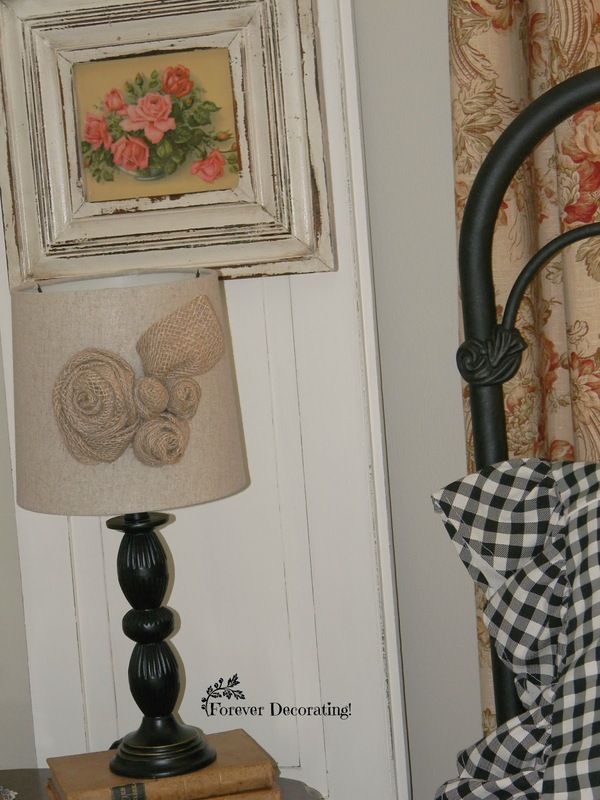 You have loaded this room with such special details! I love the bed and the shadow boxes the most! Well done indeed! If you feel like linking up to one more party I host Making Broken Beautiful every Thursday thru Sunday. It is a furniture and home decor party and I'd be honored if you would come inspire! I hope you are having a great week so far! What an absolutely gorgeous room, you did an amazing job! Your make over came out absolutely wonderful! Love it, love it! SO much to love about this makeover!! Wow! I LOVE LOVE LOVE the doors on either side of the bed for the lights -- genius! Gorgeous makeover Terry! I love the bed, the white painted border at the top and of course, all those personal touches you gave it. Beautiful work! The party is on right now. Hope to see your there. Hi Terry! Thanks for your lovely comment on my Valentine's Day Display. 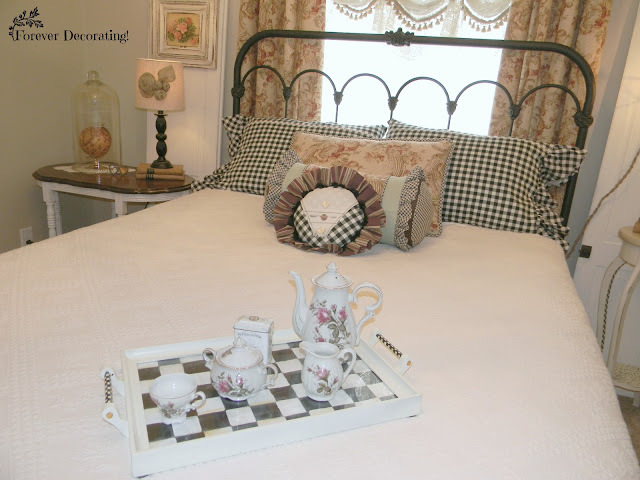 Your guest room looks wonderful! 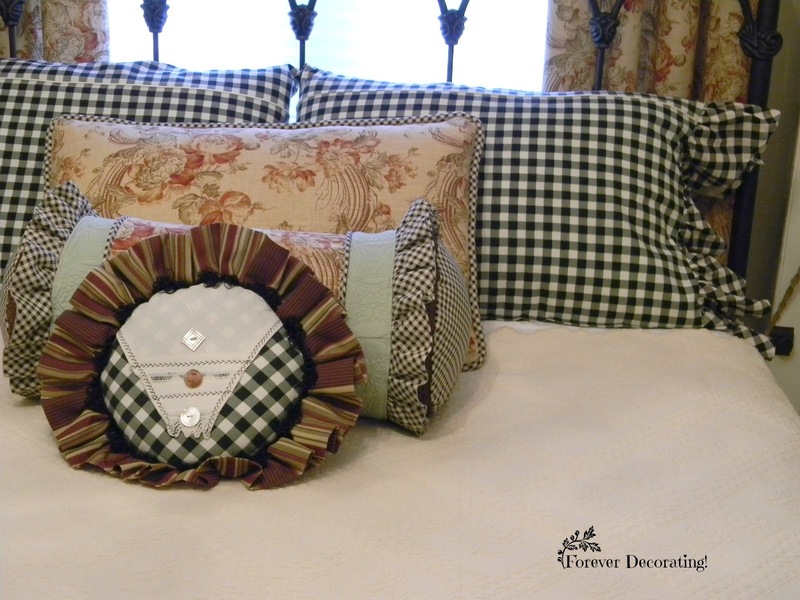 Love the MC pillows on your new iron bed. Everything came together beautifully. 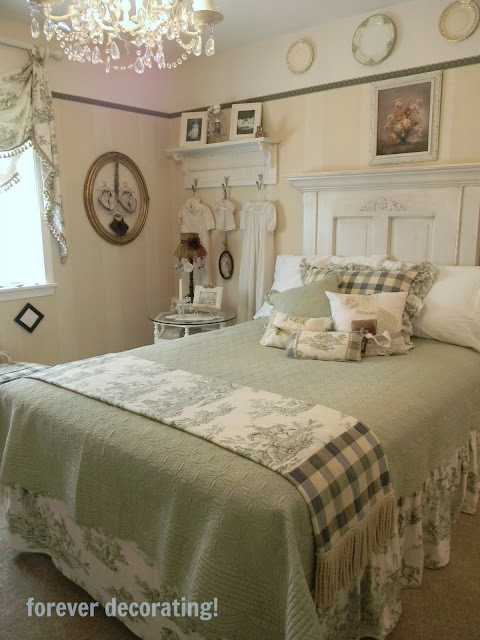 It's so charming, restful and cozy! Gorgeous room. Love the changes. Shopping the house is so fun, and allows for all kinds of changes for no money. Love that! Your makeover is awesome! Love the MK inspiration! Your room is absolutely adorable. My children won't sleep in a room with old clothing either,, I happen to have a 100 year old gown christening gown that belonged to my step-father, he remembered his mom saying she used it for an older brother, then decided to put it away, not using it again. He died a few years ago, when he was 92 years old. Grandpa Sparky's daughter wasn't interested in having any of their family treasures, so my daughter and I took charge of them -- and were happy to have them. (I should post a picture on my blog, Eclectic Grammie.) Again, your room is so adorable, warm and friendly. Terry it turned out beautiful! Hi Terry! 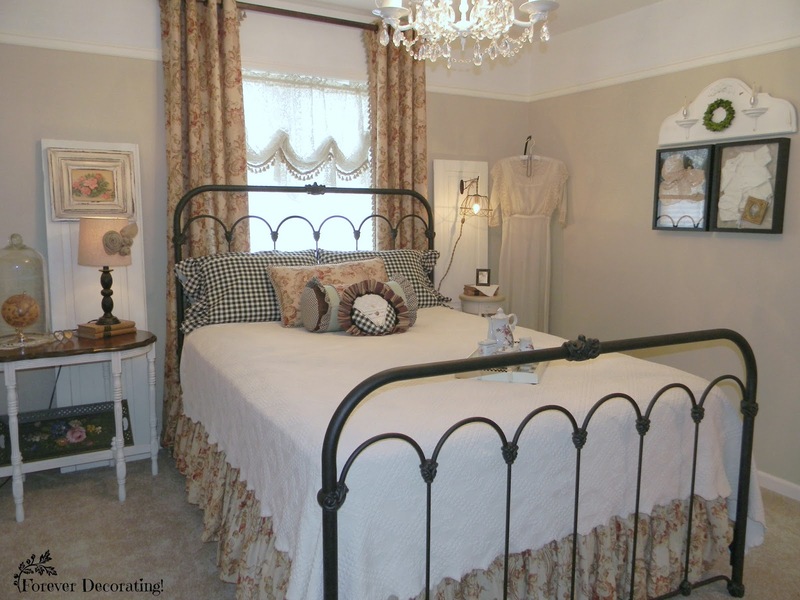 I just wanted to pop back in to let you know that I'll be featuring your fabulous guest bedroom at Vintage Charm tomorrow. It turned out so amazing! Beuatiful! love that tureen collection! 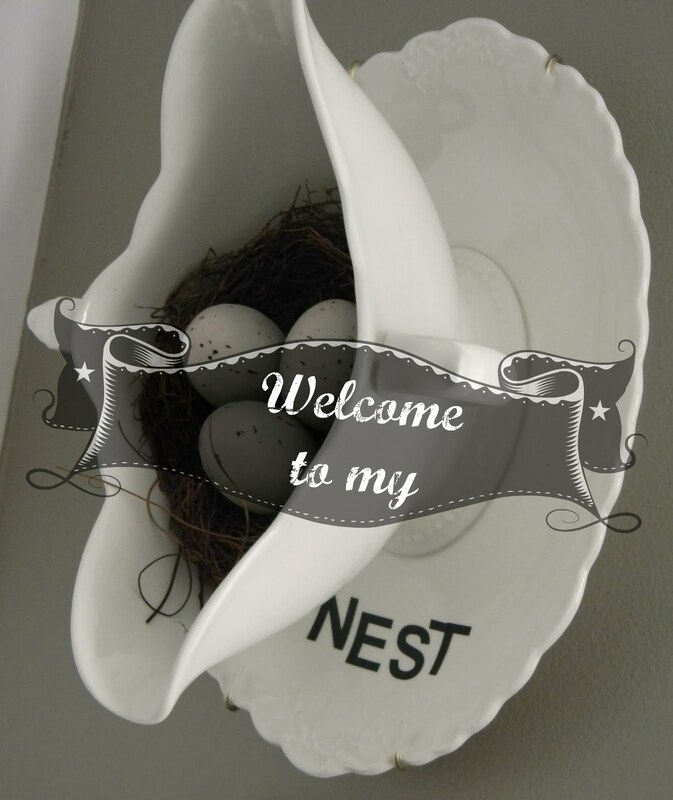 xoxoxo thanks so much for sharing this at the creativity unleashed link party! xoxo see you back tonight! Darling! I just love everything you did!